Ain’t no holiday like a nerd holiday. For number nerds around the world, today is Pi Day. Well, actually not so much the whole world. Most of the world puts the day before the month when they say a date. For North Americans, today is 3/14. Which, is taken as representative of 3.14, the approximate value of pi. Europe and most other places, however, see today as 14/3. So, really today is an American nerd holiday. Semantics aside, today is the day math geeks give us all an excuse to eat pie. Who is going to complain that? I mean, other than maybe Jillian Michaels and, frankly, I am happy for her pie hole to remain shut. 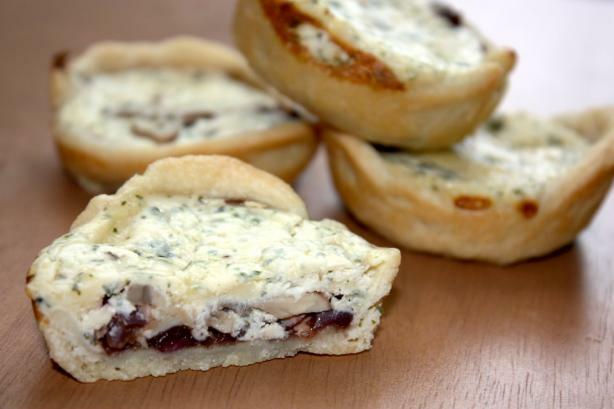 Doing my part for this glorious baked good celebration of knowledge, I am bringing you my recipe for mushroom and blue cheese mini pies. Similar to the grilled cheese I shared last week, this is another recipe that I created as part of a contest where the participants had to create an original recipe out of a list of specific ingredients. I’m going to admit that I was rather proud of this recipe. Baking is not my thing. I fit more comfortably with the artistry of cooking rather than the scientific nature of baking. Every now and then though, I manage a bit of baking that isn’t completely disastrous. This was one of those times. Mushrooms and blue cheese are two flavors I enjoy together but a little bit of that combination can go a long way. To cut through all that richness, I used red onions, sugar and balsamic vinegar to make a sort of sticky red onion marmalade for the bottom of the pies. The sweet and tangy of the mixture worked well against the richness of the other ingredients. Put a pan over medium heat and add 1 tablespoon olive oil and 1 tablespoon butter. Once the butter starts to froth, put the thinly sliced red onions in and turn the heat down to low. Cook, stirring often, until the onions have become translucent. This will take about 10 minutes but keep an eye on them. Add the sugar and the balsamic vinegar to the onions and cook on low, stirring often for about 10 minutes until the onion mixture is sticky and the liquid thickened up. Set the onions aside to cool. Melt the remaining butter in another pan and cook the mushrooms for a few minutes until they have just started to change color. Set the mushrooms aside to cool. Whilst the onions and mushrooms are cooling, layout your pie dough. You want the dough to be about as thick as a pinkie. If your pre-rolled dough is thicker roll it out to the desired thickness. Using a round cookie cutter or a glass, cut out 12 rounds of the dough. Press each round of dough into a hole of a 12 yield muffin pan. If your pan usually sticks, spray each hole with cooking spray before hand. Next, put the egg and sour cream into a bowl with the salt and pepper and beat together. Stir through the dried parsley and crumbled blue cheese. Set aside. Spoon a bit of the balsamic onions into the base of each pie. Top the onions with the mushrooms, trying to cover as much of the surface as possible. Spoon the blue cheese mixture over the top of each pie. Put tarts in the oven and bake for about 15 minutes until the pastry has gone golden and the cheese mixture has set. Take out of the oven and allow to cool before serving so the cheese mixture can firm up a little bit. This entry was posted in Home Cooking and tagged cheese, Finger Food, Vegetarian. Bookmark the permalink.